I’m a foodie. And I love to cook. A few years back, I made the decision to change my eating habits. That meant no rice, pasta, bread, and sugar. Most of the time. Even I’m not that disciplined. So, I’ve had to find healthier alternatives. It’s amazing what you can do with cauliflower when you want rice or mashed potatoes. And spaghetti squash will make you forget wheat pasta even exists. But, my one food addiction that I can not find a good substitute for is french fries. Seriously, if I didn’t think it would kill me, I’d eat fries every damn day. 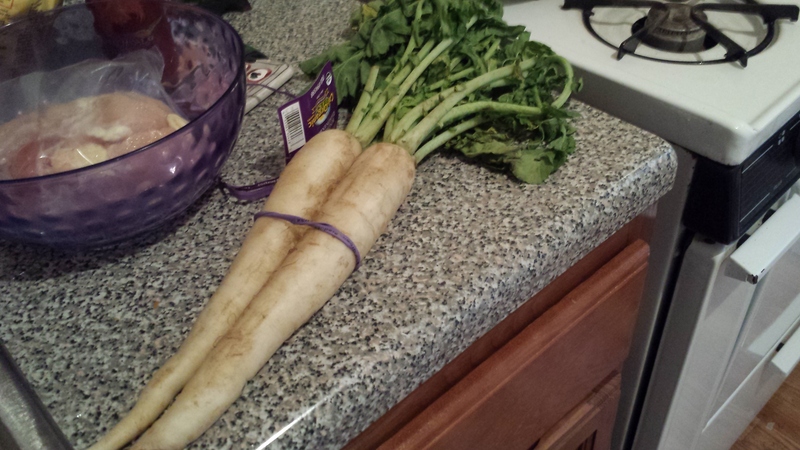 After doing some fry-alternative research, I came across the daikon radish- a big, white East Asian radish that looks like a mutant carrot. I’ve cooked the small, salad radishes before and liked them. Didn’t love them, but they would suffice if I wanted a pan-roasted/sauteed potato substitute. 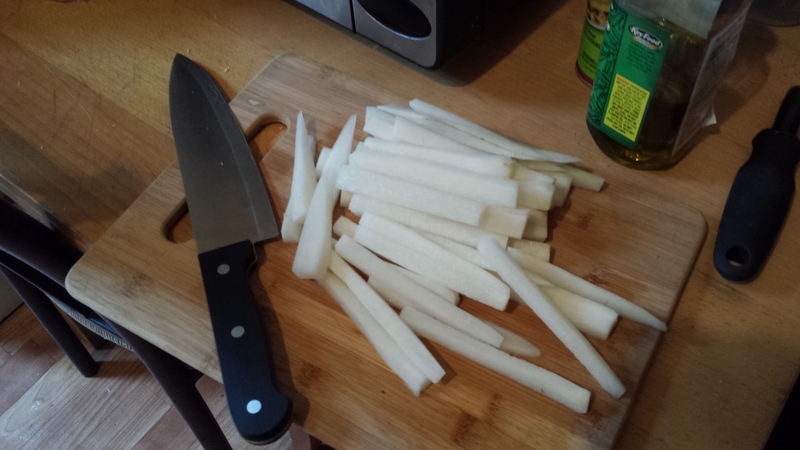 Daikon was something…else. First of all, they are near impossible to find. I had to go to Whole Paycheck Foods to get them. Surprisingly, they were only about $2.50 for 3 of them. 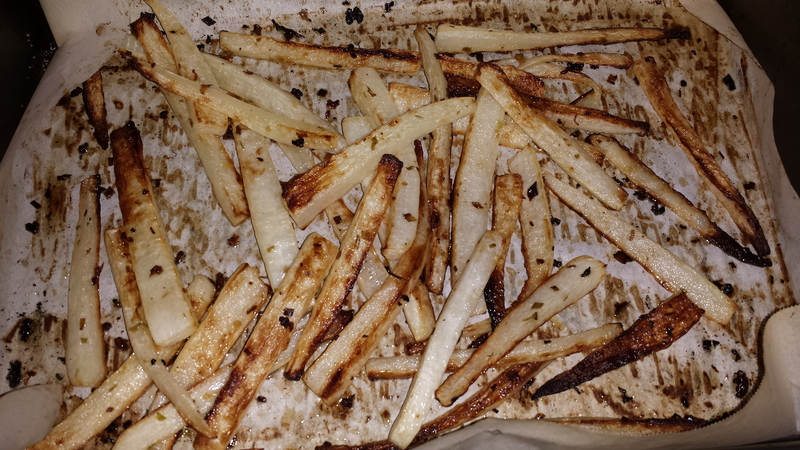 I then proceeded to make oven “fries”. Step 1: Peel and cut the radishes into basic steak fry shape. This is only 2 of the 3 radishes. Do a better job then I did making them about the same size and thickness. Step 2: Toss them in some olive oil, kosher salt, and any herbs and spices you prefer. I used fresh pressed garlic and dried chives. Step 3: Roast them in the oven at 450 until they brown. Most recipes say 30 minutes. Turn them half way through for even browning. 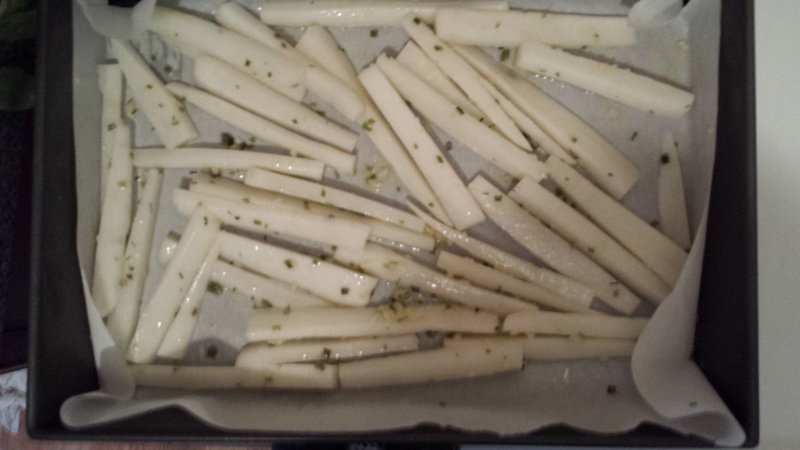 Now, do NOT expect your daikon fries to have the texture or taste of potatoes. You’ll be disappointed. They seemed rubbery to me and were a bit bitter. Maybe I didn’t cook them long enough, or I should’ve parboiled them first like some recipes suggested. Ehh. It was my first time. I’ll keep experimenting. Once I added Sirarcha mayo (which is exactly what it sounds like), I enjoyed them more. Make your own Sirarcha mayo; it really is that simple. Overall, a satisfying meal. The pizza crust recipe is courtesy of Comfy Belly (be sure to try the coconut flour vanilla cupcakes while you’re there). 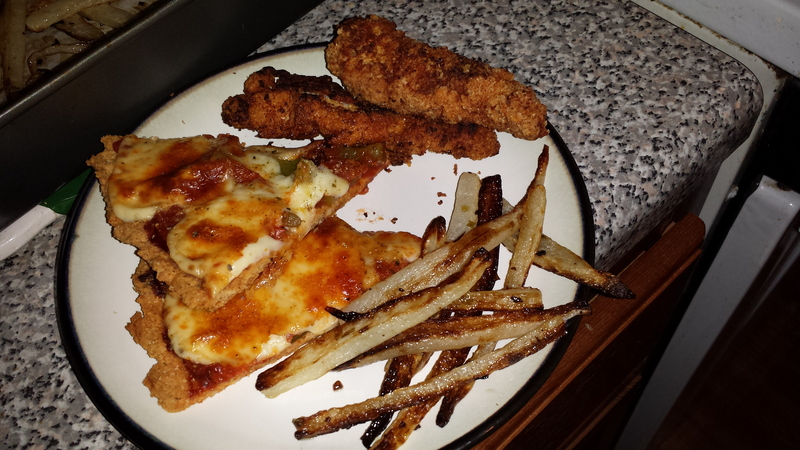 The chicken strips are my own, made with almond flour. Sorry people, fried chicken is never healthy no matter what you do to it. Oven-fried is your best option here. Verdict: 3 out of 5 stars. Maybe a different flavor combination will help. But, they sort of satisfied the craving. My recommendation: go for it. 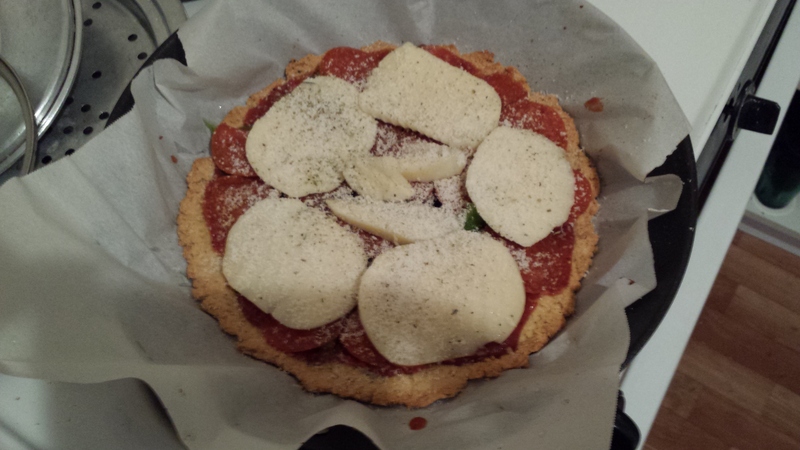 Bonus: Here’s a pic of my pizza before I overcooked the cheese. It was decent. Sirarcha ketchup was even better. This looks really yummy! Definitely have to try this out! I cooked a second batch yesterday and they came out really great, so definitely give it a try.